The books I read, the things I make, the places I go. Ack. That frogging sounds annoying! But the border looks amazing and the white boxes are just calling out to be filled in now! What a great start, even if there was a bit of undoing and redoing to be done. I love the colours, it will be a lovely project. Sometimes, when you´re counting threads you can feel your eyes getting crossed 🙂 The new pattern is looking good and I´m glad you came out right in the end! What a pretty pattern — and excellent work getting your outlines and outer border done! This will be beautiful to watch. Will you do mini-finishes with one “box” at a time? You are so good doing the borders – I’m not sure I would have had the patience – we’ve had a dusting of snow here depending where in the world you are this could be quite apt! This is indeed a perfect project for this time of year. All that counting is one reason I avoid cross stitch these days! The border is lovely. Great start to this project! I always have problems when doing borders as well. I can’t tell you how many times I’ve had to frog out stitches along a border. This is such a pretty pattern and I think it is smart to do the block outlines first…it will be a great guide now for the motifs. I know I hate when I miscount; I am forever checking and even then somehow make a mistake. But sometimes like with your slubby texture, my linen is also not flat and perfectly even. I will look forward to seeing your progress on this one. Love the pattern, the colors, the fabric, everything! Fantastic progress getting the borders done. It will make each block feel like a mini finish! I like to keep my DMC in those stitch bows too. I have them stored in a binder. My stitchbows are in binders too. I like them much better than any other way of DMC storage. I have a mini binder for the ones being used too. That’s a great idea! I’ve considered the mini binder sleeves for dmc in current use. I’m also noticing some of my sleeves are starting to tear apart at the crease 😣 But I can salvage it by adding new hole punches I guess. The mini binder is really useful. There’s room to put scissors, needles etc in there too. Some of my sleeves are getting a bit tatty too. I think the problem is that the side that folds, tends to hang down in the binder instead of lying flat. They’re lasting well though. What a great start and I love the colours! Thanks. 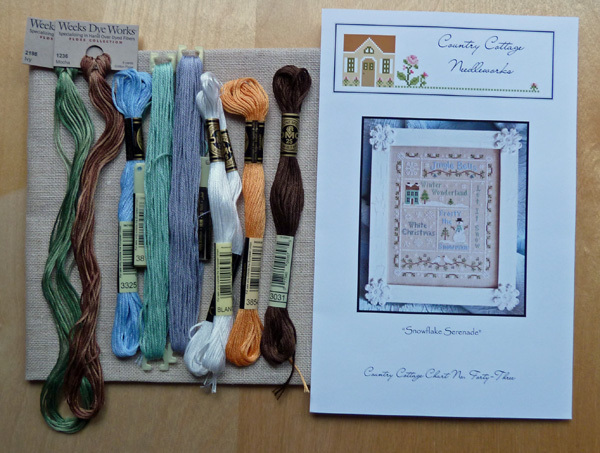 The colours are one of the things that I love about CCN designs. She’s really good with them. Wow! Great job Carole. It’s fun when you get in a roll isnt it? Love your new project! Your got a lot done, even with the frogging. Bet it feels great to have the borders done. Should be smooth sailing now. 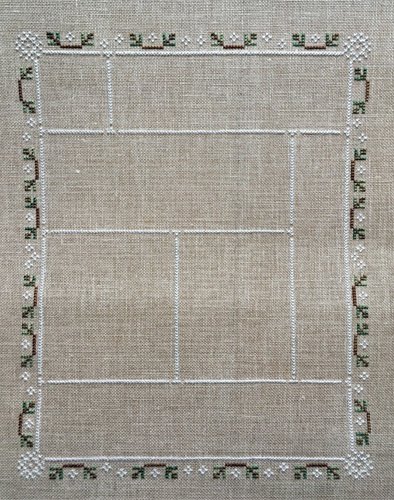 Love your choice of design and your courage in stitching the border first. I can’t count either, and no amount of recounting helps me which is why I tend to leave borders till last for fear of having to unstitch the contents of said border. This is gonna look amazing !!! This is such a cute piece and looks like it will stitch up relatively quickly! You have made a great start! 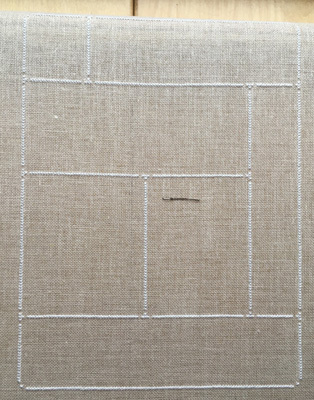 I would have been too scared to stitch the borders first – I know that I am tooooooo challenged when it comes to counting. Wow! You made great progress already! I cannot wait to see it on the 24th. Beautiful work! I’m glad I did it this way though as I’m having fun filling in the boxes. good idea to have done the boxes and border first, although it does help if you can count lol. Fantastic progress, especially after you couldn’t count at first LOL. This is a great design for the SAL with all the separate sections to complete. Very pretty too! First Carole I must apologise for missing your dance last time but it was a lovely finish and I am sure the dance was a very very happy one. I love samplers and sure I have this in one of my 3 big boxes of things to do lol. Another of your projects I will enjoy watching. Oooh, really pretty border, and I think the background colour really sets the stitches off. CCN always do simple but pretty borders.